— With managers, moonwalkers and the media watching, NASA's Johnson Space Center opened Friday a facility designed to protect and display the last remaining 363-foot Saturn V rocket to be assembled from parts once capable of launching astronauts to the Moon. "I think there is no more appropriate time to celebrate this historic spacecraft than on July 20, which is the 38th anniversary of the first footprints on the Moon," said Mike Coats, the director of Johnson Space Center and a former shuttle astronaut, in his welcoming remarks. 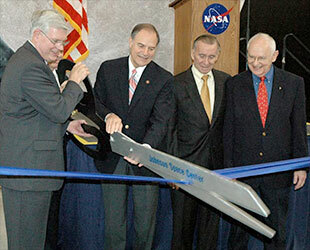 Together with Congressman Nick Lampson, Coats used an oversized pair of scissors to cut the opening ribbon. "I think this is a magnificent national treasure that will stand here now for an awfully long time to come. I am proud to have played a little bit of a part in helping get it started," said Lampson. The Saturn V is not new to the space center; in fact, it hasn't moved from where it currently rests since its arrival in Houston in 1977. For nearly 30 years, it sat on its side, exposed to the elements, from its parking space opposite the main entrance to JSC. The passage of time, subjection to Houston humidity and the infiltration of local flora and fauna were not kind to the rocket, degrading it to the point of nearly being destroyed. "It would be a real shame if no Saturn V survived and future generations had to rely on documents, films and motion pictures to appreciate the effort and achievements that was Apollo," said Allan Needell, who led the effort to "Save the Saturn" for the Smithsonian's National Air and Space Museum. "In our view, it represents or symbolizes the enormous Apollo achievement perhaps better than any other object in the national collection," said Needell. The Smithsonian, which owns the Saturn V and loans it back to NASA for display, began fundraising in 1999 for the rocket's restoration. Half of the $2.5 million required for preservation of the rocket came from a matching grant from the Save America's Treasures Program operated by the White House, National Park Service and the National Trust for Historic Preservation. The remaining funds were raised through donations from Boeing, Lockheed Martin, Houston Endowment, Halliburton and other organizations. Conservation Solutions, Inc. was hired by the National Air and Space Museum to conduct the restoration, which began in March 2004 and took two years to complete. In addition to repairing the damage, the company returned the Saturn V to its original appearance, including restoring the rocket's original markings down to the smallest decal. "This is the one in which we decided to do a historic preservation. So not only the final product, but literally every square inch of it was photographed and documented as a part of the process," Needell explained to collectSPACE. "So what we have is the best surviving example of Saturn V hardware that there is." 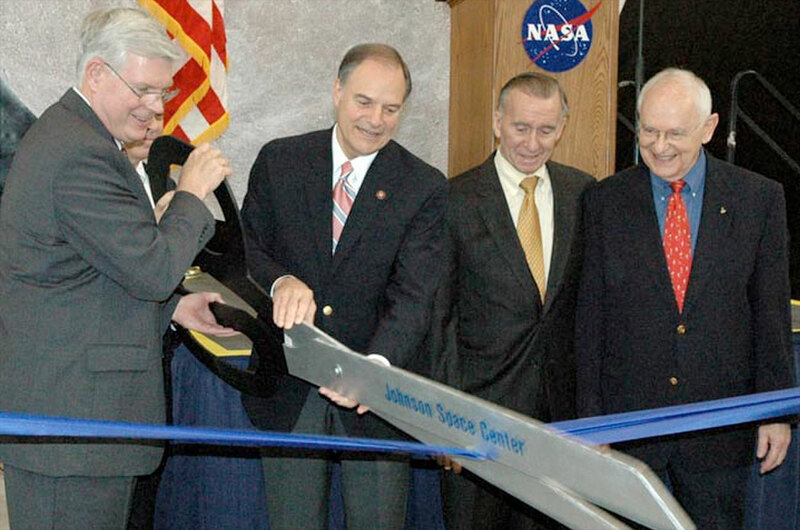 CSI also erected a climate-controlled building to protect and exhibit the rocket. The "temporary" facility, designed to stand for 10 years, shields the Saturn V from weather and the environment, while permitting visitors to tour the massive booster. 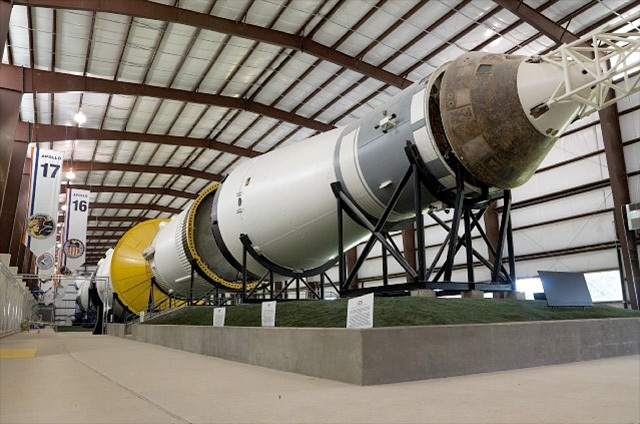 NASA's exhibits department added turf under the rocket, a paved walkway, banners and displays to enhance the tourists' experience. "It's very good to show people what we did. You know all these things on the wall that say what everyone did during the Apollo program, I think it's very important to do that. It's how you get kids turned on to science and engineering," astronaut John Young told collectSPACE. Young is one of only four astronauts to have launched on a Saturn V twice, including once to walk on the Moon. Thirteen Saturn V rockets were launched between 1967 and 1973. Nine of those boosters took astronauts to the Moon; six of them to a landing on the lunar surface. The last Saturn V to leave Earth lofted the United States' first space station, Skylab. To date, the Saturn V remains the most powerful rocket ever built. NASA's current plans for returning to the Moon include the construction of the Ares V rocket, which in addition to sharing a similar name, would stand as tall, if not taller than its predecessor and exceed its capability. "It's a great challenge to try to do what these guys did, do it with modern technology, do it for a lot less money then they did it for, frankly," said Jeff Hanley, who is leading NASA's Constellation Program, to collectSPACE. "I think today's generation, what I'm finding, is a lot more ready for the challenge than maybe they would give themselves certain credit for." Two complete Saturn V rockets remained after the Apollo Program ended and NASA made the change to launching reusable space shuttles. Stages from both were used for JSC's display. Other flight stages were placed on exhibit by themselves and used to create a similar display at the Kennedy Space Center in Florida, in addition to replicas. 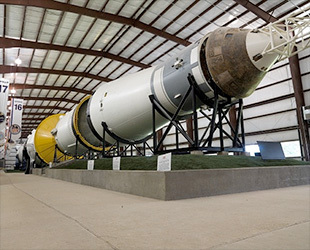 A third Saturn V, also recently restored by CSI, resides in Huntsville, Alabama. Built to test the rocket with support facilities, Huntsville's Saturn V was never to fly in space. "This is a future historical artifact for people from the 25th century to look back and say 'With the incredibly crude science of the 20th century, how did they manage to go the Moon?'" Skylab astronaut Joseph Kerwin said with a smile. Johnson Space Center's Saturn V opens to the public at no charge beginning this weekend. The facility will remain open daily from 9:00 a.m. to 6:00 p.m.